An orange dot marks where the vine will go (every three feet). A hole is dug by hand. We just finished a very successful planting of 1,400 Cabernet Sauvignon vines. The last day was grueling as the best slope was saved for last. This particular slope consists of a very large pile of rocks. And not much else. Cabernet vines produce the best wines in excessively well-drained, droughty soils. I cannot wait to taste the wine (2022? ), but getting the vines in the ground took a Herculean effort. It’s hard to dig rocks. One pries rocks using a cleaver tool called a digging bar, which is the agricultural equivalent to a carpenter’s cat’s claw. The really big rocks require a team of two or three people. 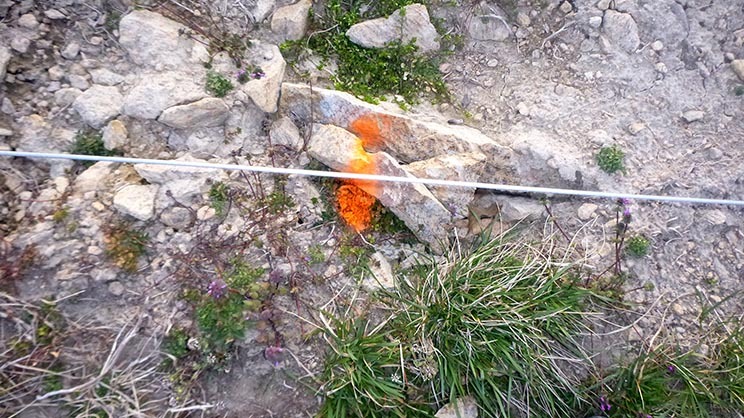 Sometimes the rocks are immovable which means we creatively plant around the orange dot designated by the tape measure. Sometimes we can wedge out one individual rock that leaves a hole large enough for planting a vine. But this results in a soil deficit, meaning there is no soil available to pack around the vine’s roots. Just rocks. So we planters scurry around, shovel in hand searching for a bit of earth to put back in the rock voided space technically called a hole. Soil became a highly sought after commodity. We humans are territorial. As we moved up and down the slope, tempers flared a bit with accusations of soil stealing. These vines will struggle, especially when they are young. It takes a while for the roots to find veins of soil in between tightly packed rocks. Fortunately we received a good soaking rain the day after planting. The meager handful of soil around the vine roots would have dried out quickly. Before we started planting, Jonathan referred to this site as the rocky knob. That name will live on. I’m sure.